We were asked by an insurance company to clean up this Mercedes. 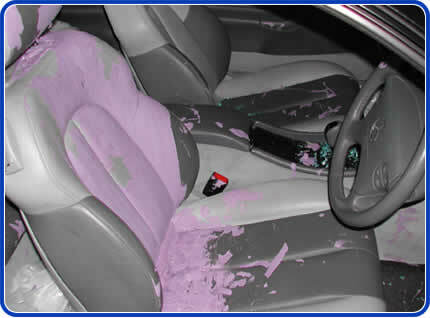 Although it is not uncommon for us to resurrect cars vandalised with paint, usually it occurs on the outside. More commonly we have to remove accidental paint and varnish spills but they tend to be in one location, usually in the boot. What really set this car apart from most others we have dealt with was that the paint was everywhere and on all kinds of material. The Vandal had thrown a brick through the drivers window which had damaged the outside of the drivers door before going through the window, it had then hit the door panel of the passenger's door causing some damage to the trim. 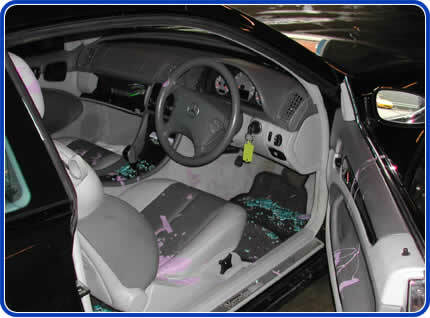 The vandal had then splashed the paint all over the inside of the car. The paint ended up on all the carpets, all four seats, all door trims, the dashboard and even the headlining. With paint covering plastic, vinyl, leather, velour and carpet, this was going to test our skills to the limits.